This entry was posted in Food, Uncategorized and tagged apple bread, Apple Pie, baking, bread, bzz agent, Caramel, got a coupon, homemade, Honeycrisp, Kid Friendly, Pip and Ebby on January 26, 2015 by fivemarigolds. I just love Valentine’s Day! Such a fun day for kids to express friendship to one another. Dub loves tearing open the goodies, but EClaire really loves to see the creativity of the Valentines and read the messages from her friends. 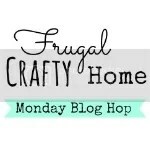 Today I’m sharing printables and ideas for Valentine’s Day. 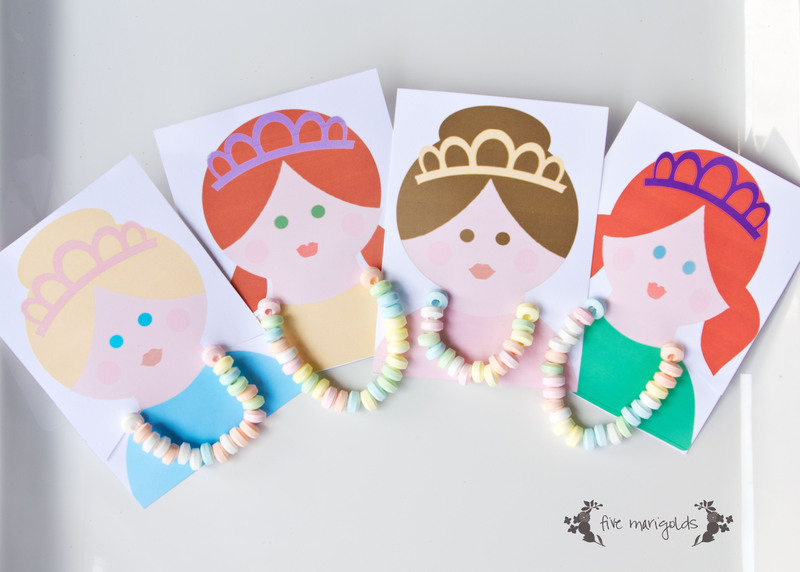 I designed these for EClaire’s princess party this summer, and adapted them again for Valentine’s to be more inclusive of boys in her class. 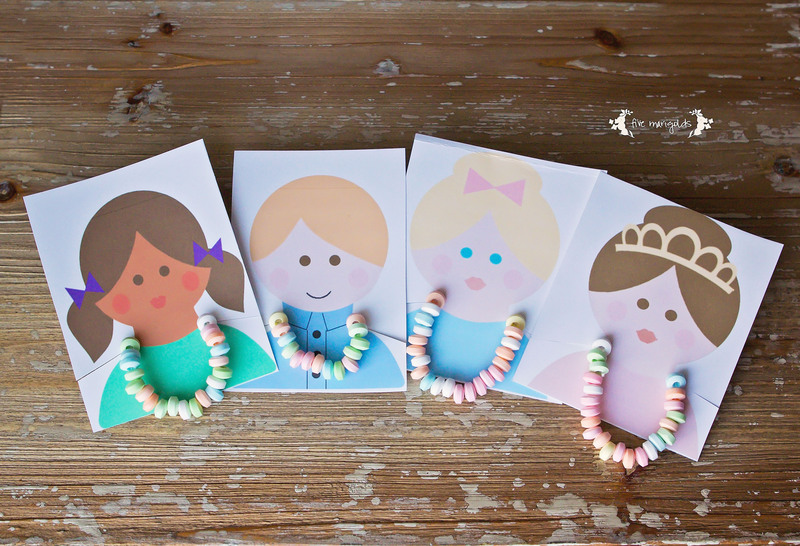 Just print these out, cut two slits, add the candy bracelet (I get mine at Dollar Tree 10/$1) and sign the back. Find the original post and download here! Dub is obsessed with Minecraft! So, I created this “Be Mine (craft)” printable to wrap a box of Conversation Hearts for an inexpensive Valentine. Just seal with some stick glue and sign the back. Download here. This Valentine by Paging Super Mom was a hit among the preschoolers Dub gave this to years ago – and their parents who loved the non-sweet Valentine. 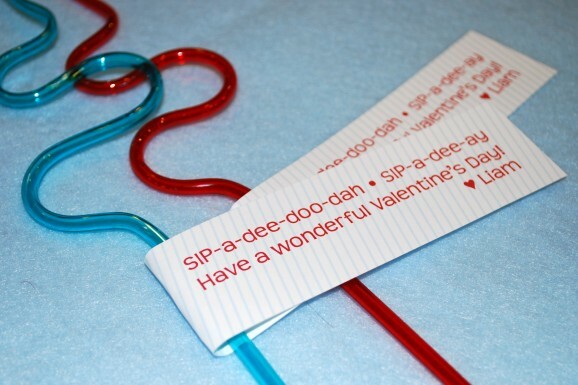 I used the heart shaped curly straws from Hobby Lobby (10/$1) and signed his name on the printable in PhotoShop. Super cheap and easy. 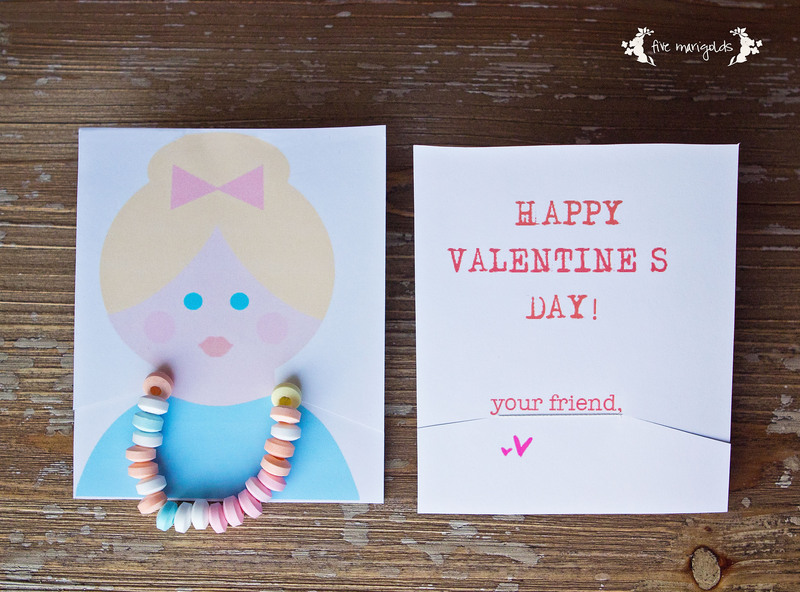 Last year EClaire had so much fun putting these Kool Valentines together! Simply download the printable here and affix to the back of Kool-Aid packets with a heart sticker. I digitally added her name, but you can sign yours for a more personalized touch. I absolutely loved the candy button favors I made for EClaire’s princess party this summer, so I recreated them for some homemade and very inexpensive Valentines. The kids think this is such a novelty that it’s always a hit! Find the full instructions here. There you have it, just a few of the Valentines we’ve given over the years. What do you think? Will you be using any of these this year? Please take a moment to tell me about it, below! 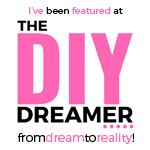 In addition to being featured in the fab blogs shown on the buttons to the right, this post was also featured on Huckleberry Love. 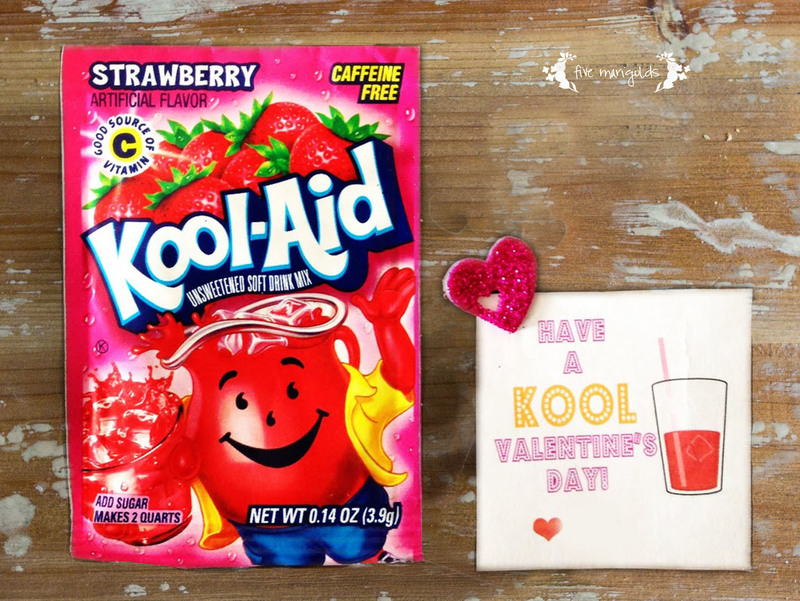 This entry was posted in Kids, Valentine's Day and tagged Be Minecraft, Candy Buttons, Candy Necklace, crafts, diy, dollar tree, downloads, Free, homemade, Kool-Aid, Minecraft, printables, Valentines on January 19, 2015 by fivemarigolds. You can find this linked up at the buttons you see at the right, and also at Tator Tots and Jello, Craft-o-Maniac, Huckleberry Love.and That DIY Party. This entry was posted in Kids, Valentine's Day and tagged Be Mine, Be Minecraft, Creeper, Free, Minecraft, Printable, Simple As That, Valentine, Valentine's Day on January 12, 2015 by fivemarigolds. Looking for a fun and healthy(ish) after school treat? 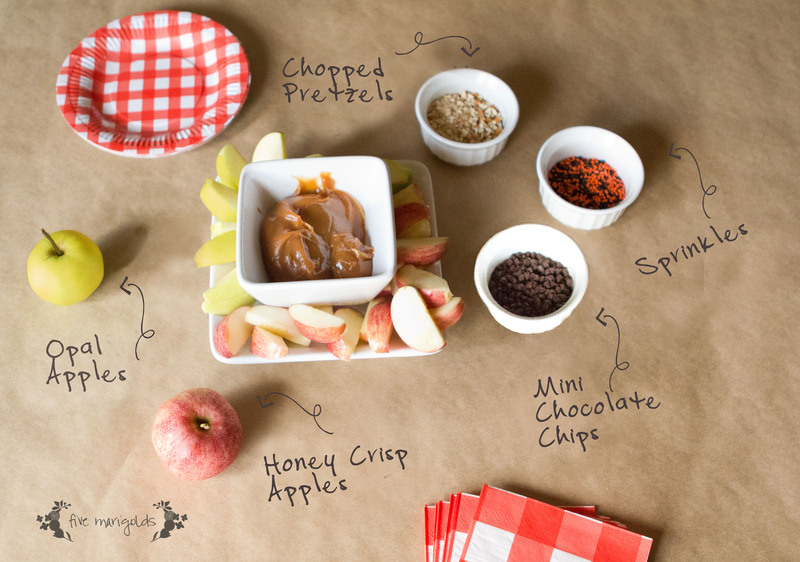 I love the idea of a caramel apple bar, where your little ones can help themselves to sampling healthy apples with some sweet toppings. Just set out a fun array of toppings – choose chopped nuts or pretzels, chocolate chips, peanut butter, or caramel or chocolate sauce.. Then set out a variety of sliced apples to choose from. I always love to get Honey Crisp when they’re in season, and this time I tried Opal apples. I picked up some Opals because I received a coupon from BzzAgent to try some for free in exchange for sharing my opinion. While they’re not available in every grocery store, you can spot them easily at participating grocers by their bright yellow color. Something that makes Opals unique is their non-GMO no-browning claim. While I’ve found them to eventually succomb to browning in my experience, they are non-browning enough to pass the school lunch test – in that they still look good enough for my finicky 6-year old to eat hours after I’ve sliced them for lunchbox prep! I also like that they are sweet, but not too sour – which makes Opals a winning apple in our home. As a marketer by profession myself, I love a company with a good cause marketing campaign, and Opals are a brand with heart – a portion of Opal Apples’ sales goes to their Youth Make a Difference grants, which support youth-led non-profits involving food, nutrition and agriculture. Would your little love a caramel apple bar? Tell me about it below. I’d love to hear your favorite tasty apple toppings ! This entry was posted in Food, Kids and tagged apples, bzzagent, Caramel, caramel apple bar, Got it free, opal apples, organic on January 9, 2015 by fivemarigolds.